IT'S 7.30 on a Monday morning and already, as train driver Joe Ozols pulls into Hoppers Crossing railway station, the platform is heaving with passengers. We're not running late - but we soon will be. Ozols has been up since 4am and is driving back to Melbourne after a run to Werribee. 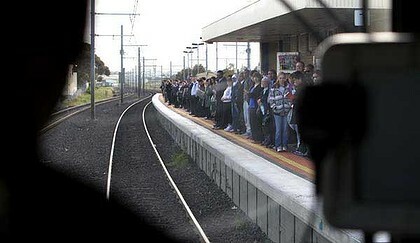 On the way out, he ran four minutes late, after his train got stuck behind a Geelong-bound service in Footscray. ''If V/Line isn't running late and we aren't running late it all works, but if one of them is, we get in each other's way,'' says Ozols, who has driven trains in Melbourne since 1975. Running on time is getting harder and harder, says Ozols as we pass through Newport with a train full of passengers. It is not yet the height of the morning peak. Passengers on Footscray station platform look uniformly miserable as we pull in, and it's the drivers who bear the brunt of their rage when trains aren't on time. ''If you're late, they're angry, tapping their watches telling you as you go by,'' another driver, Nick Verhaar, says as he pulls into Richmond station on another morning peak-hour service. Melbourne's commuters are tapping their watches more often these days, with increasing numbers coming to rely on the city's rail services - just as the city's rail services run reliably late. With just two days until voters go to the polls, the city's bursting train system is an election issue like never before. And a worried Labor Party is bracing to find out just how many commuters are out there, tapping their watches and waiting to tell Premier John Brumby they're angry - and his time's up. Four years ago, Labor was seen as the better manager of Victoria's public transport. But after years of problems and relentless attacks from one of the Coalition's best performers, Terry Mulder, the situation has reversed. Metro has run 12 per cent of the city's trains late this month. It isn't the improvement Brumby promised when awarding Metro its $8 billion contract last year. ''Passengers will notice changes from day one,'' Brumby told Parliament, in comments the opposition have not let him forget. Ask the city's 873 drivers why services so often run late and they will likely nominate crumbling infrastructure and failing systems. Problems this week alone give evidence of just how vulnerable the train network is. On Sunday, the creaking train radio system broke down for 15 hours, slowing trains all day. On Monday tracks buckled at Frankston, and a broken train at Westall delayed services in the south-east all morning. On Tuesday trains slowed from 50km/h to 20km/h in one City Loop tunnel after tracks came loose and were temporarily secured - with wood planks. Rail networks everywhere malfunction but in Melbourne, as frustrated travellers know too well, minor breakdowns regularly cascade into major delays. Metro driver Tim Purkis has been running trains in Melbourne for 23 years, and nominates signalling failures among the factors making Melbourne's trains run late too often. The Age accompanied Purkis on a morning rush-hour trip this month where, as happens so often, a signal with a minor fault delayed him. As we wait at the signal just before Camberwell station, Purkis calls the train controllers to report the fault. After a delay of a minute we continue until, on the other side of Camberwell, we find a more seriously broken signal. ''I've probably just lost a minute or so, and every train behind us has lost that too,'' says Purkis as we wait. After three long minutes, we move on. Already, without any major dramas, we are running four minutes late. Melbourne's train system was neglected for decades, as kilometres of rotting wood sleepers across the network attest. From 2005, as petrol prices passed $1 a litre and Melbourne's population boomed, train patronage skyrocketed: 162 million train trips in 2005 had by 2009 jumped to 214 million - the most in Melbourne's history. When that boom happened, Labor and Connex were slow to act. By 2009 there were just 10 per cent more services a week than in 2005. As passengers became bitterly angry about overcrowding, Labor promised big with its $38 billion Victorian Transport Plan, a list of projects the government either didn't have the money for, or that would have happened anyway. On the ground with drivers it's hard to see what difference Labor's much-advertised plan has made. Long-time drivers say there is at least now work under way, unlike during the Kennett era. ''We had nothing done for years, and then all of a sudden we got line extensions, level crossings being removed, concrete sleepers going in and the overhead being fixed up,'' says Purkis. But there is a long way to go, he says. Drivers are all too aware of the domino effect of even the smallest hold-up; wheelchair passengers, for example, take around two minutes to get on or off. The train fleet has big problems too. A fifth - the Siemens trains - have braking problems, meaning speed restrictions of 30km/h as they pull into platforms. All of these little problems mount up, driving commuters crazy with late and cancelled trains. ''If one train is delayed then it throws everything out,'' says principal driver Shayne Tempest, who has been on the network since 1980. Melbourne has all the ingredients for the world's best transport system. It has a workhorse tram network. It has state funding. It has an absolutely massive heavy rail network which can be upgraded to metro quality frequency and standards by simply running more trains as the PTUA suggest. It has a loop (which could be used more efficiently). SmartBus services are finally adding cross-town and orbital connections to feed rail lines, which will make patronage soar even more. The tram system can be upgraded to light rail by increasing stop spacings, making vehicles bigger and giving priority to the tram. The ingredients are there, the governance to make it happen unfortunately is not-- yet. There is a lesson here for Brisbane. Build infrastructure before they come. When they come it will be too late. Petrol + Mortgage + Household costs will drive patronage increases. I'd have thought from reading the article that it wasn't the size of the network but dreadful lack of maintenance and upgrading, leading to the 'minor fault' cascade. Lack of redundancy in the system is apparent. One thing goes wrong - and one thing seems to be going wrong lots of times a day - and the whole system slows down. Sydney has the same problem if not worse, Brisbane ditto but maybe not quite so bad. More trains on a crumbling network means more delays, mere congestion. Lots of dough for maintenance and upgrades, creation of redundancy etc etc before late running is eliminated. Oh, they could try the 'tried and true' method that both Brisbane and Sydney have indulged in - relax the timetable and b****r the passengers.